Experience a weekend to remember at one of the top clubs in Staten Island. Find information, reviews, and everything you need to know about the best clubs on Staten Island. A Trendy, Upscale Club in Staten Island! Bringing a little bit of Miami to the NYC area, Eve is one of the best clubs Staten Island has to offer! 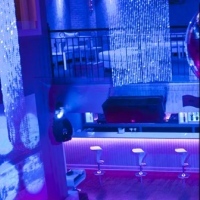 The two-level club/lounge contains elevated, lavish VIP sections and high ceilings. Adorned with two beautifully sculpted life size angels and a huge disco ball, the second level lounge rewards you with a full view of the dance floor. Complete with state-of-the-art sound and lighting, Eve caters to the trendiest crowds in NY. Ask one of the professional mixologists to whip you up the perfect martini or pick from a great selection of top shelf liquor, champagne, and wine. If you choose to celebrate your birthday at the club, the venue offers free admission for up to 5 guests and 1/2 price admission for over 5 guests. Plus, you receive VIP service and a complimentary bottle of champagne.